Um er-Rasas (Kastrom Mefa’a) is strongly associated with monasticism and with the spread of monotheism, including Islam, throughout the region. The artistic and technical qualities of the mosaic floor of St Stephen’s church justify describing Um er-Rasas as a masterpiece of human creative genius. It also presents a unique and complete (therefore outstanding) example of stylite towers. This is an archaeological site of the Roman, Byzantine and early Muslim periods. The site was founded in the 3rd century AD as a Roman military camp, closely associated with the frontier (limes) of the Roman Empire, the border with the desert and possibly with the eastern branch of the incense route. The large camp (castrum) gave the site its ancient name – Kastron Mefa’a. The roughly square fortified castrum (about 50 m by 150 m is almost unexcavated. While the castrum itself became the core of the later settlement, the ruins of the Byzantine settlement outside it cover an area of about 200 m by 300 m.
Among the visible and partly excavated structures on the site are several churches. These can be easily identified before excavations and attracted the main attention of archaeologists working on the site since 1986. For this reason, much less is known of the character of housing, town plan, and daily life. Among the extraordinary remains on the site are several mosaic floors, one of which of special importance. The mosaic floor of the Church of St Stephen shows an incredible representation of towns in Palestine, Jordan, and Egypt, including their identification. 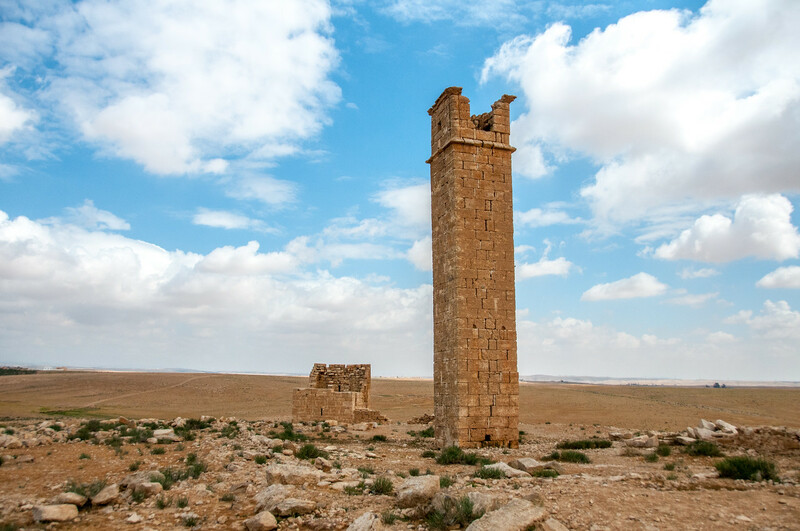 At a short distance from the town, a well-preserved tall tower from the Byzantine period is probably the only existing remnant of a well-known practice in this part of the world – of the stylite ascetic monks (i.e. monks sitting in isolation for long periods on top of a column or tower). The tower has no stairs and is in a relatively isolated area. 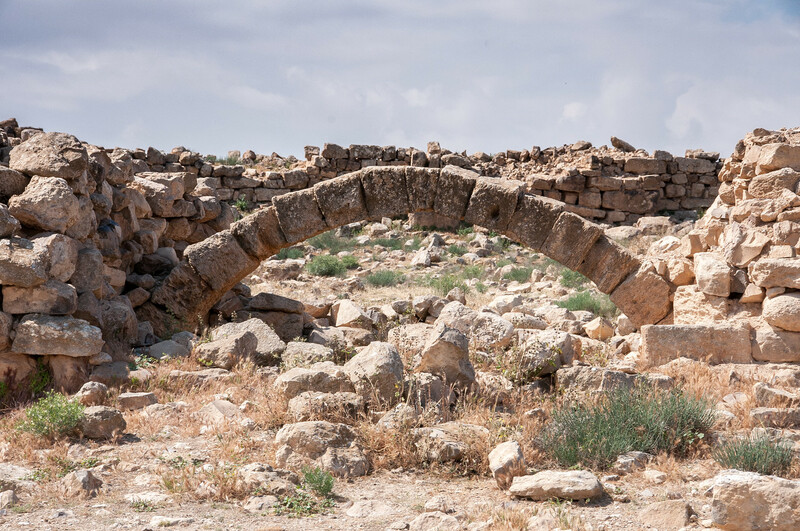 Um er-Rasas (Kastrom Mefa’a) is surrounded and dotted with remains of ancient agricultural cultivation, from water reservoirs to terracing, water channels, dams, and cisterns. There are two small cemeteries on the site, one immediately to the west and the other to the east. The Eastern is an old Bedouin cemetery, whereas the Western is a modern one. About 150 m separate the site and the main modern north-south road. In this area, there are several ruins of relatively new structures, from the mid-19th to the mid-20th century, but now abandoned. 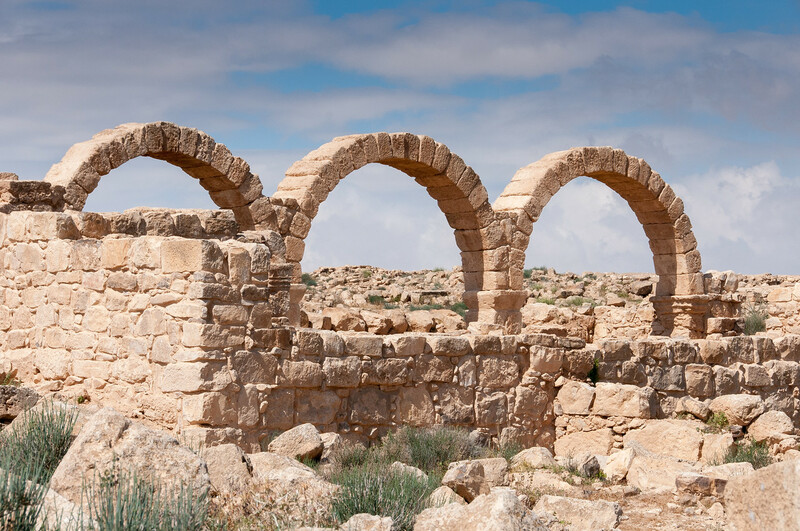 Um er-Rasas is easily the least visited World Heritage Site in Jordan. It isn’t easy to get to. It isn’t on the way to somewhere else and it doesn’t get anything close to the visitors of a place like Petra. In fact, when I arrived there was no one else there. There was no one working the ticket window and the doors were wide open. Others who have visited have reported the same thing. However, I found this site to be absolutely fascinating! The primary reason for its listing is its incredibly well preserved mosaic floors. They are easily the largest and best-preserved mosaics I’ve ever seen. They are the remains of Byzantine church floors and there are several at the site. The largest one is the church of St. Stephen. It has been excavated and currently rests under a shelter to protect it from the elements. Many of the human images in the mosaics were destroyed during the Byzantine iconoclastic movement of the 8th century. The rest of the site is almost entirely still buried in rubble. I’ve never before had the feeling of visiting something unexplored like I had here. You can literally walk over the buildings and look down on the arches which are still standing. I even found a shard of pottery laying on the ground! There is still an enormous amount to be discovered here. It is just a matter of funding. Um er-Rasas (Kastrom Mefa’a) is approximately a 30-minute drive outside of the city of Madaba. Unlike the other world heritage sites of Jordan, I know of no regular tours which visit Um er-Rasas. 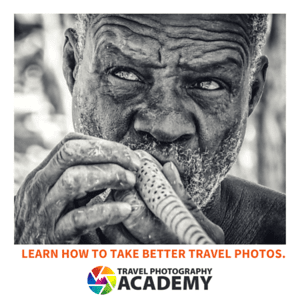 You will probably need to hire a guide or rent a car to visit the site, but it is well worth it for those who are inquisitive. Um er-Rasas is a cultural UNESCO World Heritage Site in Jordan. It was inscribed in 2004 as an archaeological site. The site contains the ruins of the early Muslim, Byzantine, and Roman civilizations in Jordan. The location of the ruins is around 30 km southeast of Madaba. It served as the capital city of the Madaba governorate in central Jordan. The location of Um er-Rasas is in the midst of a semi-arid steppe region in the Jordanian desert. The site was even mentioned in the Book of Jeremiah. The most recent excavation at the site took place in 1986 but archaeologists believe there are more ruins as a large portion of the area is still covered in debris. Um er-Rasas is a 5th-century site that encompasses numerous ruins from the early Muslim, Byzantine, and Roman period. It is currently governed and managed by the Ministry of Tourism & Antiquities of Jordan, along with UNESCO since it was named as a World Heritage Site of cultural value. Um er-Rasas served as an important pilgrimage site for Christians during the 8th century. There are pilgrims from all over the world who travel here in order to participate in pilgrimage activities. Some of the monks also inhabit the stone towers at the site. One of the towers measures up to 13 meters high. Um er-Rasas consists of 16 churches in total. Despite the fact that the site consists of many archaeological ruins, expert archaeologists believe that there are more that are yet to be excavated. For 1200 years, the site is undisturbed and that can be credited to its excellent state of preservation and authenticity. There are a few notable features of the excavated part of the Um er-Rasas namely the Roman military camp, frontier camp of the Limus Arabicus, ‘Kastron Mefaa’, and numerous churches. 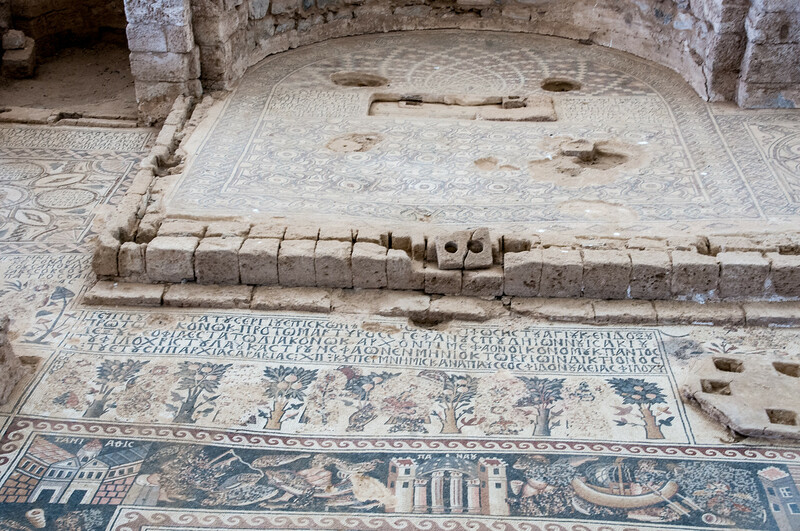 In addition to the structures that were excavated at the Um er-Rasas, the mosaic floor at the Byzantine Church of Saint Stephen is one of the most noteworthy finds. This mosaic is believed to be a map or representation of the cities in the region such as Madaba, Esbounta, Areopolis, Belemounta, Philadelphia, and more. The mosaic is dated to have originated in 785 even though the discovery did not take place until in 1986. 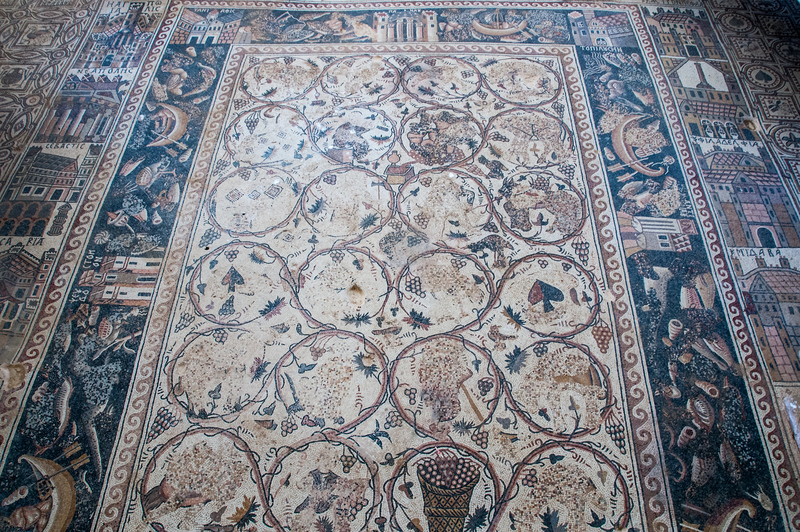 The perfectly preserved mosaic floor is also the largest of its kind in Jordan. The mosaic floor’s central panel depicts fishing and hunting scenes. There are also four other churches within Um er-Rasas that were found to have mosaic decoration as well.